So, you might remember that I set some biltong (South African beef jerky) up to cure a couple of weeks ago. And now we have the finished product. I somehow got “It’s Biltong Time” – to the tune of Flight of the Conchords’ “It’s Business Time” – stuck in my head during this process. Biltong, as you can see, isn’t quite the same as American beef jerky: you cure it in large, thick strips then slice it up to serve. Where jerky is all tough and leathery, biltong is actually moist and red inside. This was my first time making my own, I learned a lot. The biggest lesson: get the leanest cut of meat possible. I used a pretty lean London broil, but still wound up losing some meat in post-cure fat trimming: the fat can develop an unpleasant rancid flavor while the meat hangs. Anyway, I still had plenty of biltong after trimming fat. I love it, and kept eating little bits of it when I was cutting it up to serve – which was actually kind of a problem, since I was supposed to serve it at a South African table for an “Around the World” party my law school had. The party was last week, but because of all the Oscars craziness this weekend I’m only just getting around to South African posts. I served half the biltong straight up – and it was actually a huge hit! My classmates are more adventurous than expected. The other half of the biltong I chopped up and put into scones for those who weren’t into uncooked home-cured meat. 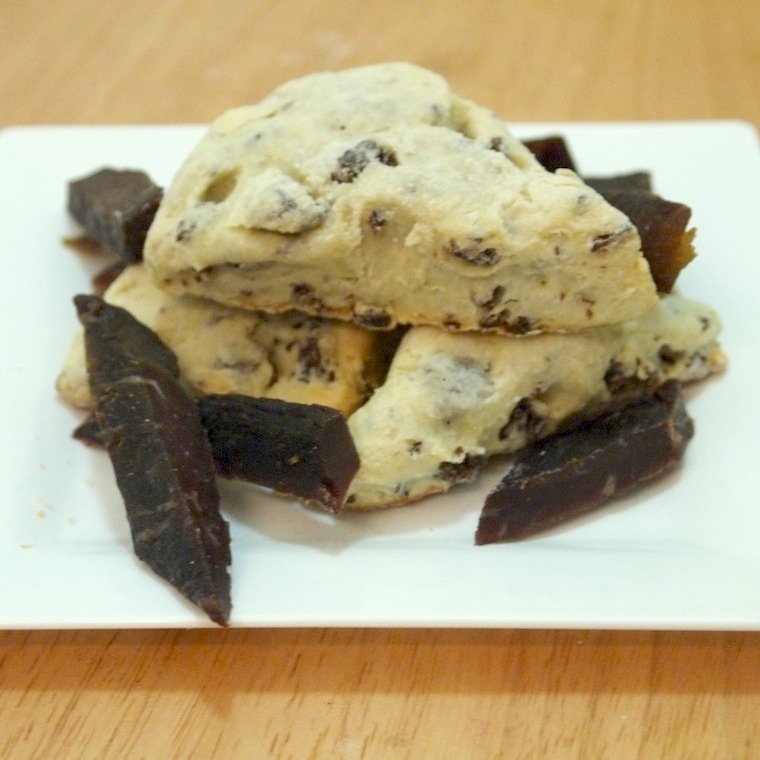 Baking really tones down the jerky’s gamier flavors; these scones had a kind of bacon biscuit quality to them, though they are denser than American buttermilk-based biscuits. 1. Preheat the oven to 450 degrees and line a baking pan with parchment. Pulse the butter, salt, and flour together in a food processor for about 10 seconds until the mixture reached a cornmealy texture. 2. Put this into a mixing bowl, add the milk, egg, and Worcestershire, and mix with a wooden spoon until just blended. 3. Turn this dough onto a lightly floured surface and knead about 10 times. Flatten the dough into a 1/2-inch thick disc and cut into 8 wedges, or into a 1/2-inch thick square and cut into 12 rectangles. 4. Place the scones on the prepared baking sheet and bake for 12 minutes until lightly browned on top. Serve hot, with butter. I LOVE biltong…too bad you can’t…er…carry it to the States! I never thought about in scones, but I can see how I would love this, too! Oh how delicious that look! I love beef Jerky, and that one is just so so calling my name:)) Yum! Haha, Business Time is such a funny song! Now its stuck in my head…. These look great, I love the combo of biltong in a scone! I’ve never tried to cure anything. Definitely on my to-do list. I love beef jerky so I’m sure I would love biltong. I’ve made beef jerky before but nothing this ambitious. I’d have never thought to put it in scones either. What an incredible idea. Just made toad in the hole but with chili bite style biltong. It’s simple but it works…. Hmm, just what I am interested in doing – the refrigeration drying thing. I would like to make ‘authentic’ Voortrekker billies where cool, breezy dryness is the secret to it all + roasted coriander & salt. However I live in a sauna where nothing dries out except the wallet. I see from your photo that the end-product looks excellent! Please let me know about temps and times it took to get there.